We’re big fans of Canadian Immigrant magazine and the Brits in Toronto crew love to idly thumb through its pages when we find a copy on the TTC subway, usually between St. George and St. Andrew, so we’re pleased to give it a free promo for its annual national award. Open to immigrants across the nation. But would be GREAT if a Brit in Toronto made the cut! 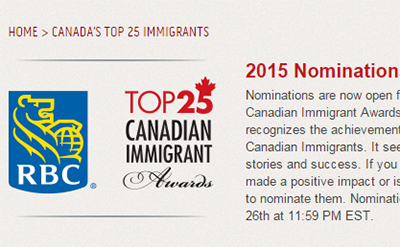 Nominations are now open for the seventh annual RBC Top 25 Canadian Immigrant Awards. This coveted national award recognizes the achievements and accomplishments of Canadian Immigrants. It seeks to uncover and celebrate their stories and success. If you know of an immigrant who has made a positive impact or is an inspiration to others, click here to nominate them. Nominations close on Thursday, February 26 at 11:59 PM EST. So there you have it. Nominate away … and good luck to one and all! This entry was posted in Uncategorized and tagged brits in toronto, canadian immigrant, RBC, top 25 canadian immigrant awards on January 29, 2015 by britsintoronto. We have to say Samantha Russell was literally the fastest turnaround we’ve had so far on Successful Brits in Toronto. From Twitter ask, to following her, DM’ing an e-mail address, sending off the questions, having a cup of tea while we waited, to receiving the answers, to adding them here … literally took 24 hours. We like that enthusiasm for self-PR and so does the Googlebots that crawl our website daily! A move from England was never on my radar until 2011 when my boyfriend at the time received a promotion which would take him to Toronto. Long story short, he ended up moving to New York instead and the romance didn’t last. In the meantime I’d fallen in love with the idea of Toronto and moving away from England, so I packed up and moved anyway in September 2012. At first it was a “try it and see” as I’d never been to Canada and didn’t know anyone here, but I’m happy to call Toronto my home now. I applied for a lot of positions through agencies while I was still in the U.K. but didn’t have much luck. I got my first contract position a month after I arrived, then I had one more contract position before I found the permanent job I have now. The worst has to be the winter weather — I’ll never get used to that. The best has to be the people, the diversity of the city and the many many things you can do in and around the city, especially in the summer. I don’t make too much effort anymore unfortunately, however I was a member of a lot of Facebook groups for people coming to Toronto on working holiday permits so I met a lot of people through that. I also went along to a couple of meetup groups for Brits. My recommendation for best Brit pub has to be the Dog and Bear on Queen West; I instantly feel like I’m back at home there. I’m glad it’s my local! Grin and bear your first winter in Toronto. Yes, it’s brutal … but the summer makes it more than worth it. Take advantage of all the things you can do in the city like ice skating, cross country skiing, all the amazing bars and restaurants, the green space like High Park, and all the different cultures, just to name a few — you’ll soon fall in love with the city. Thanks Samantha, seems like you’ve successfully settled in Toronto. 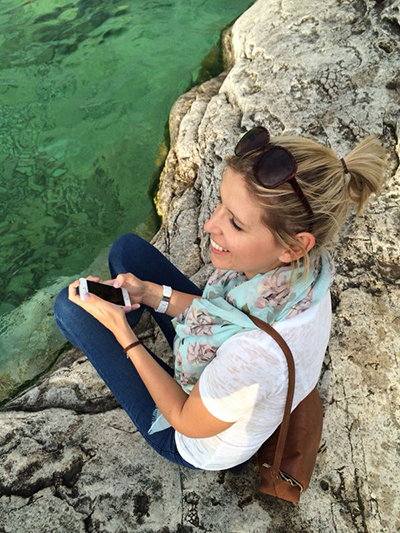 If anyone wants to connect, here’s her Twitter account and LinkedIn profile. Cheers! This entry was posted in Uncategorized and tagged brits in toronto, samantha russell, successful brits in toronto on January 27, 2015 by britsintoronto. Some very sad news today, the passing of long-time (since 1972!) 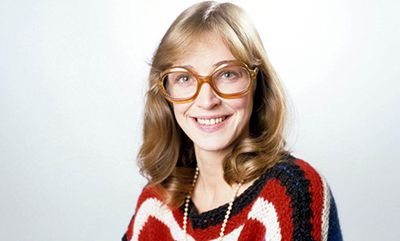 Coronation Street star Anne Kirkbride who played the famous Deirdre Barlow. The Brits in Toronto crew send their thoughts across the pond. This entry was posted in Uncategorized and tagged anne kirkbride, brits in toronto, coronation street, deirdre barlow on January 19, 2015 by britsintoronto. Where can we find Francis Gordon? Questions questions, give me no answers, but to cut a long story short where can we find Francis Gordon? We get a ton, literally two e-mails a fortnight, asking for help. This one is very interesting … trying to track down a Brit’s old friend. 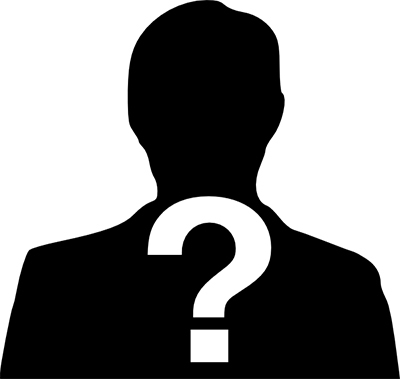 “Hi, as a surprise for my husband I am trying to to trace an old school friend of his. Having moved house we have lost touch. His name is Francis Gordon from Liverpool. His son Lee played ice hockey in Toronto. “He was an engineer by trade, a musician by heart. Played for pleasure in Lycra, on his guitar. Now into his mid-sixties the timing to make contact is now. With strawberry blond hair and plenty of it in his late ’40s … a bit of a mullet. I am sure someone will know him. So, if Francis Gordon is reading this or you can get us in touch, give us a shout with the Brits in Toronto contact form or e-mail britsintoronto AT gmail DOT COM. 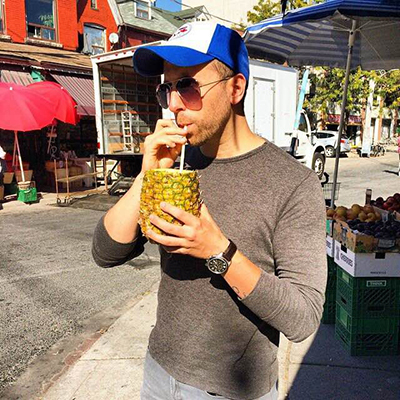 This entry was posted in Uncategorized and tagged brits in toronto, francis gordon on January 17, 2015 by britsintoronto. Hello there! Founded in 1953, we are the Toronto Scottish Rugby Football Club (TSRFC). Operating three times a week during the April to October season in the downtown core, our current roster holds both male and female teams, and boasts over 100 current Canadian and British players alike. When counting our alumni, friends, and business/sponsor numbers, our network literally connects thousands of people. Whether you’re looking for a social outlet or some seriously good rugby, we support five teams combined, four of which play in the best possible division in the province. While TSRFC certainly can’t guarantee work or quarters, we will certainly do our due diligence to help. Once you’re part of the Club, you’re family, and that’s exactly how you’ll be treated. If you’re concerned about costs, a payment plan is very possible after a one-time, up-front percentage fee. We even have a guy who gets us discounted boots! Excluding indoor training locations which vary from season to season in the late winter, practice times are consistently 6:30 p.m.-8:30 p.m., conveniently situated at either Sunnybrook Park at Leslie and Eglinton, or North Toronto Collegiate Institute (NTCI) at Yonge and Eglinton. Our sponsors include the Globe and Mail and the incredible Duke Pubs chain. We regularly attend the Duke of Kent at Yonge and Eglinton on Thursday evenings after training, so if you just want to get your feet wet to see what we’re all about, you’re more than welcome to join us in the upstairs area around 9:00 p.m.-9:30 p.m. 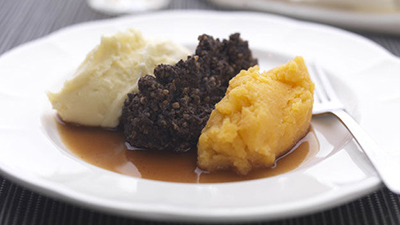 The Duke of York and Duke of Devon are also no strangers to us, but we usually reserve those for special events. Regardless of your intention (unless it’s to mock us!) visit our website at www.torontoscottish.ca for more information, including training and game fixtures and maps, as well as the social happenings and specific contacts for each part of the Club. This entry was posted in Uncategorized and tagged brits in toronto, michael loney, toronto scottish rugby football club, tsrfc on January 11, 2015 by britsintoronto.